The Long handed inserter is an electric inserter that picks up and places items two tiles from its location instead of the usual one. They are commonly used for placing items on a belt that is three tiles away from either an assembling machine or a furnace. Long handed inserters have trouble grabbing moving items from express belts, but can do it if the belt is compressed enough. 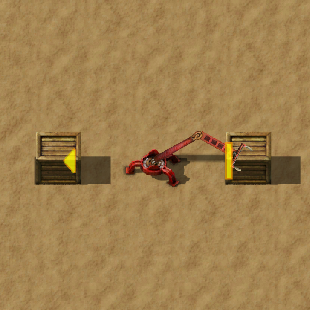 They can't grab moving items from red/blue turning belts if the item is on the far side. They can also grab items past north facing cliffs that go straight across, though cliffs of any other kind are too thick for the inserter to reach across. This page was last edited on 11 April 2019, at 04:00.